Walking the Camino was Rev. Karen’s way of introducing today’s talk – when she made the El Camino pilgrimage, she realized how very heavy all that “stuff” is, when you must carry it all on your back. When packed lightly, we are more open to new experiences – not locked down with all that “stuff”. When we are free of possessions, we are more in the moment, more open to miracles. She gave several historical explanations of Biblical stories, including the one about the camel and the eye of the needle. Rev. Karen then broadened to discussion, asking, “What about in your life?” What baggage or possessions no longer serve you, either physically or metaphysically? You can gracefully and reverntly let go of them, and thus lighten your load. The author talks of the discomfort of # 2, the transition phase, and thus people skip over it. Yes, endings are sad, but to receive the gift – the freedom to do something entirely new – we need to experience the between-time fully. 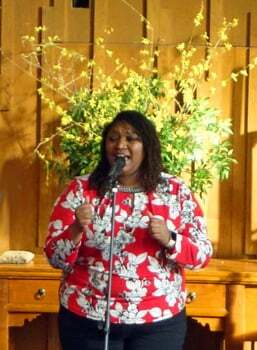 Shaunyce Omar, our guest artist, was deeply enjoyed with her gorgeous voice.